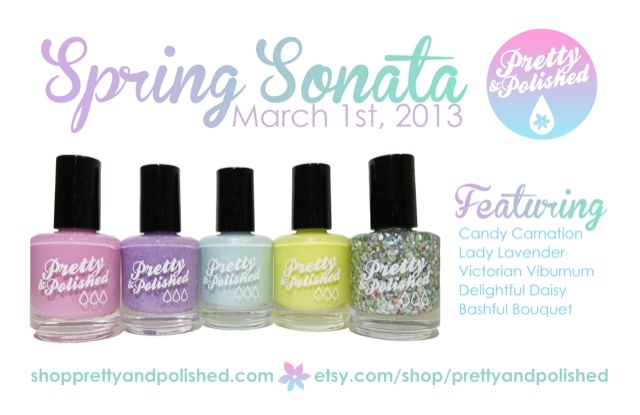 Spring Sonata by Pretty & Polished!! Gorgeous Spring colors with a glitter topper that looks amazing over each shade!! These gorgeous polishes will be available today! You can purchase Pretty & Polished on Etsy or Pretty & Polished on MyShopify. You can also find out more information, upcoming collection information, along with swatches on Pretty & Polished - Facebook and at http://www.prettynpolish.com/. I highly recommend taking a look around. There are so many different options, I feel like Chels, the owner, does a great job of mixing it up to keep everyone happy! This is two coats of Candy Carnation with Wicked Fast top coat. This is a gorgeous pink with shimmer through it. It applied perfectly! Next we have Lady Lavender. For Lady Lavender, I used 2 coats with Wicked Fast top coat. I did place upsidedown for a minute to bring the hexes to the brush easier. This purple is packed with the medium purple hexes and microglitter in purple throughout. It almost twinkles as you move. Next we have Victorian Viburnum. Victorian Viburnum reminds me of OPI I Vant To Be A Lone Star, but slightly more green/blue than the pale blue. This is 2 coats with Wicked Fast top coat. The second coat I applied a little thicker. This applied beautifully and the pearl to this gives it an elegant finish. Next we have Delightful Daisy. This is two coats of Delightful Daisy with Wicked Fast top coat. Yellow can be a hard color to buy because it can be sheer and need lots of coats. Delightful Daisy is perfect in application and the pearl in this one also gives a great finish to the color. Next we have Bashful Bouquet. I have 1 coat of Bashful Bouquet over each polish, topped with Wicked Fast top coat. Bashful Bouquet is over Candy Carnation. Bashful Bouquet is over Lady Lavender. Bashful Bouquet is over Victorian Viburnum. Bashful Bouquet is over Delightful Daisy. Next we have Stay Classic, which is apart of the Gentlemen Prefer Blondes collection! I started with 1 coat of Sphere by Pretty & Polished! This is an oldie but a goodie! My light box doesn't show off the stunning shimmer, but this still looks awesome! Here is the shimmer!! Sorry the lighting makes my skin look weird! I tried to adjust, but then I lost the color and shimmer. The shimmer shifts red to green, reminds me a little bit of Clarins Unicorn Pee (230)!! I layered one coat of Stay Classic over Sphere, and topped with Wicked Fast. I think it kind of looks like galaxy nails, but an easier version LOL!! Love the tiny little multi colored glitters in this. You can sort of see the shimmer in Sphere in this lighting! In case you missed it above, you can purchase these TODAY at Pretty & Polished on Etsy or Pretty & Polished on MyShopify. You can also find out more information, upcoming collection information, along with swatches on Pretty & Polished - Facebook and at http://www.prettynpolish.com/. Great swatches! Those colors are so pretty! Especially that yellow!